The main appeal of hydrangeas is their long-blooming flowers, which often continue for weeks, even months. The reason the flowers hang on so long is that they don’t have petals at all. Rather the “flowers” are colorful showy sepals, which are sterile. For example, the flower heads of big-leaved mophead or hortensia types consist mostly of showy sepals with a few small fertile flowers within. The sepals can’t be pollinated so they don’t go to seed – and that’s what prolongs the show of flowers. Another big bonus is that most types come into bloom in mid-summer after the majority of flowering shrubs have already finished their show. This is the colorful shrub that many gardeners lust after when they appear en masse in flower shops, particularly at Easter. H. macrophylla cultivars come in two main flavors – the lacecap group which have flattened flower clusters of small fertile florets with scattered showy sterile florets often forming a ring around the margin – and the mophead or hortensia group, with showy rounded clusters of mostly sterile sepals. Unfortunately, most cultivars are not flower-bud hardy in many colder regions. Big leaf types bloom on the previous season’s growth, so the stems generally die back to the ground, seldom producing flowers in sites colder then Zone 6. But two new cultivars, one sold unter the trade name Endless Summer, the other called ‘Blushing Bride’, are much hardier. More information on these plants. Native to China and Japan, peegee types are very cold-hardy. Large, long-blooming cone-shaped white flowers that change to dusky pink in autumn, then fade to tan. These shrubs flower on current season’s growth, so prune in late winter or early spring. Often trained to a single trunk as a small tree, but is most attractive as a big, multi-stemmed shrub about 10 feet (3 m) tall. In bloom, the heavy flower panicles of most cultivars arch downward to give a weeping effect. Grow in loamy, moist, but well-drained soil; sun or part shade. Cultivars: The common name “peegee” comes from the “p” for paniculata and “g” from ‘Grandiflora’, an old cultivar introduced in the 1860s. Has large white flowers that grow 8 to 10 inches (20 to 25 cm) long and about 5 inches (12 cm) wide. ‘Pee Wee’ is a form that has smaller flowers, but doesn’t necessarily grow into a smaller shrub. Some of the new cultivars are more handsome, but not as hardy as ‘Grandiflora’ (Zone 3). ‘Limelight’ (shown above, right) boasts large lime-green flower heads in mid-summer that gradually fade to pink. The graceful white flower panicles of ‘Kyushu’, a new cultivar from Japan, are more airy and open than ‘Limelight’. ‘Pink Diamond’ has buds that start out pink, but the sterile sepals tend to open into a pinkish white, before fading to dusky pink. The recently introduced ‘DVPpinky’, sold under the trade name Pinky Winky (shown right), has large upright-facing 12 to 16 inch blooms. The flowers begin white, but turn dark pink. 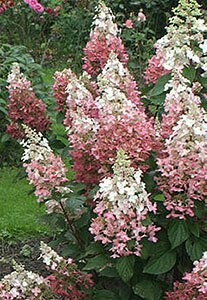 Each flower-head has some pink and some white, which gives a striking effect. ‘Tardiva’ has graceful open, erect 6 inch (15 cm) long flowers that open in late summer and bloom into September. ‘Unique’ has enormous white flowers that can grow 15 inches (40 cm) long and 10 inches (25 cm) wide. ‘Little Lamb’ grows about five feet (1.5 m) tall and has flowers up to 15 inches (40 cm) long that can weigh stems down when the plant is young. 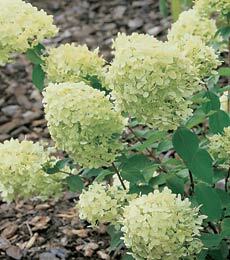 Native to the woodlands of the eastern United States, this is the hardiest of the hydrangeas. 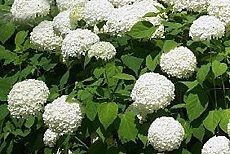 Thrives in shade or part shade, but also in sun. Likes humus-rich, slightly acid soil and plenty of moisture. Flowers on new wood, so treat it like a perennial and cut almost to ground level in spring. Flower heads open greenish white and then turn white. Cultivars: ‘Annabelle’ (shown above) has showy 7 to 8 inch (20 cm) wide globe-shaped flower heads. Its flowers turn brown rather than rose-pink, so prune off when blooming is finished. ‘Grandiflora’ (once known as ‘Hills of Snow’) is an older cultivar with looser, less showy flowers. ‘White Lace’ is a recent introduction with big, flat but rounded flower clusters surrounded by large sterile florets. Its flowers dry nicely, so you don’t have to prune them off for winter. Native to the southeastern United States, this handsome hydrangea has leaves that resemble the red oak. The leaves turn a burgundy shade in the fall. Long, upward pointing, creamy white flower panicles, like those of Snow Queen (shown above) turn dusky rose-pink on maturing. This shrub produces flowers on old stems, which means the buds can be winter-killed in the northern part of their hardiness zone if temperatures go lower than 9.4°F (-23°C), but they are worth growing for the leaves alone. In northern regions, give young plants winter protection with extra mulch and a burlap covering until they are established. Oakleaf species and cultivars like fertile, moist, but well-drained soil; full sun to part shade. Keep root zone cool and moist with a layer of mulch and regular deep watering. Pruning generally not needed, but if necessary, do right after flowering. 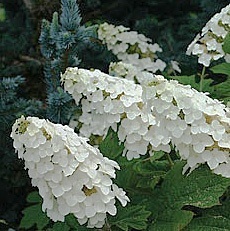 Cultivars: ‘Flemygea’ or Snow Queen, its trademark name, (shown above, right) has large, upright-growing sterile flowers 6 to 8 inch (15 to 20 cm) that make it showier than the species. ‘Alice’ has larger sepals and grows a bit bigger. ‘Pee Wee’ is a more compact form, about 3 to 4 feet (about 1 m) tall and wide with smaller leaves and flowers.